Point Mugu State Park spans from the Pacific Coast Highway to the edges of Conejo Valley in Ventura County. Hiking here especially in the spring provides a beautiful experience as the waterfalls have water and the wildflowers are in full bloom. 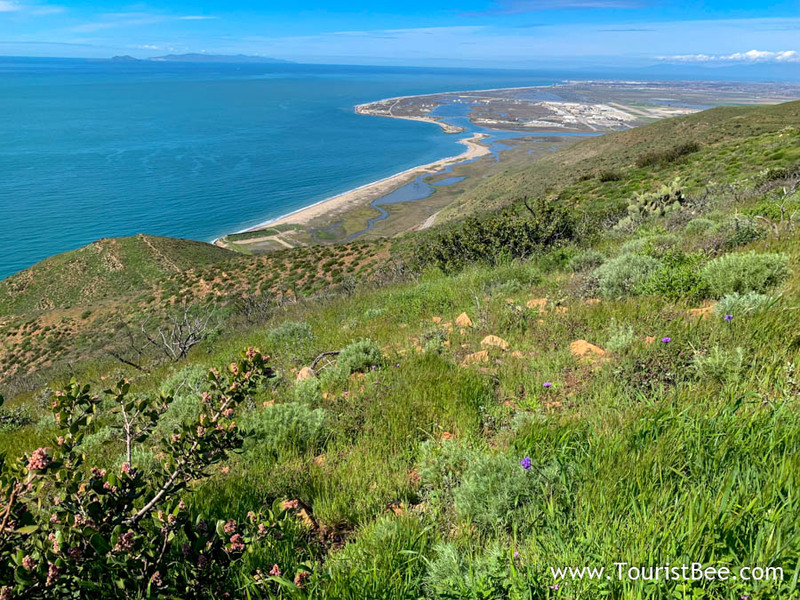 Come along with me as I tell you about my favorite places in Point Mugu State Park, from tall peaks all the way to sandy beaches. Driving North on the Pacific Coast Highway from Santa Monica towards Malibu you find yourself closed in. On the right the towering Santa Monica Mountains and on the left the Pacific Ocean. Point Mugu is the place where the Santa Monica Mountains end before the Oxnard plain and the Santa Barbara area further north. Come along with me as we explore Point Mugu State Park together. On the North Side of the park, Boney Mountain is the highest peak and the main destination in the park. On the South Side of the park, Mugu Peak is the next highest peak providing amazing views of the ocean. 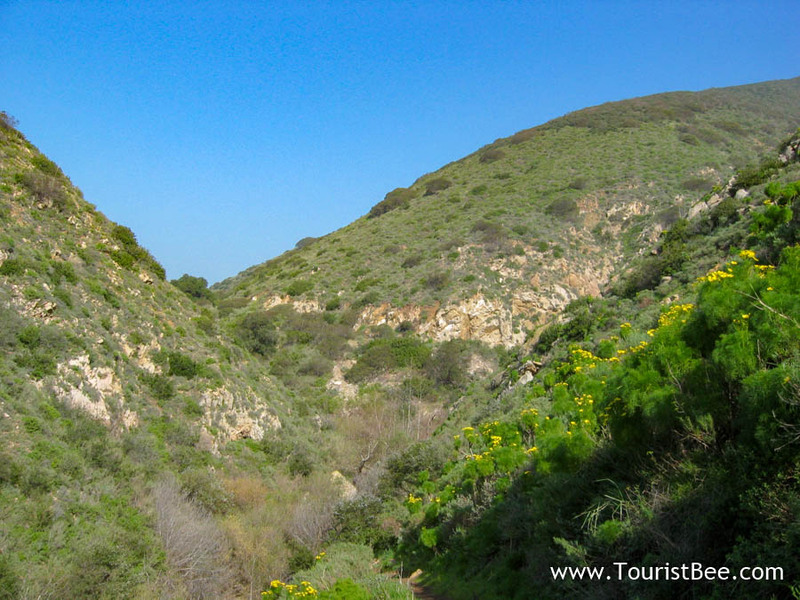 Still on the South Side we find two canyons with beautiful hiking trails: La Jolla Canyon and Sycamore Canyon. Enjoy the sun at the Point Mugu State Beach. This beach is not very well known and therefore is not crowded at all. Just a great place to enjoy the California sun. 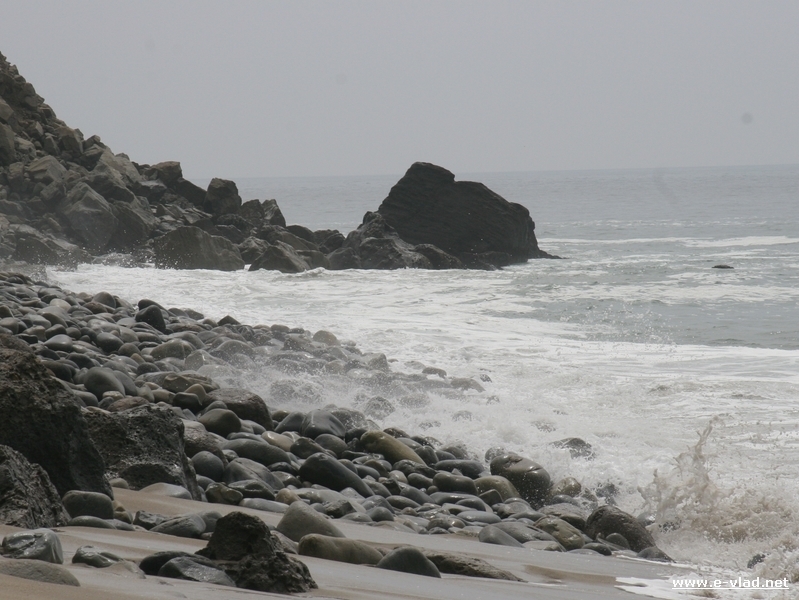 Right across Pacific Coast Highway we find Mugu Rock which is the symbol of this area. There is plenty of free parking right next to the rock. 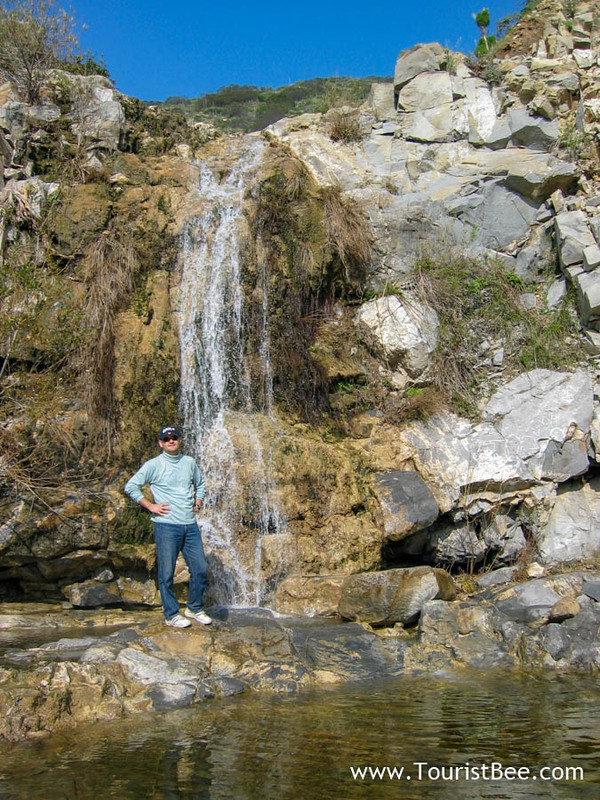 You can hike to the top of the Mugu Rock and enjoy an amazing view of the ocean and surrounding mountains. 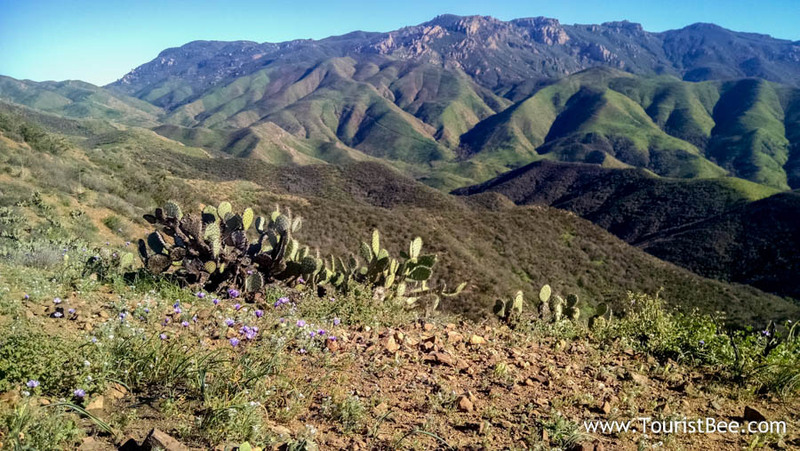 At just over 2800 feet high, Boney Mountain towers over the entire Point Mugu State Park area. It represents the towering presence visible from most areas inside Point Mugu State Park. 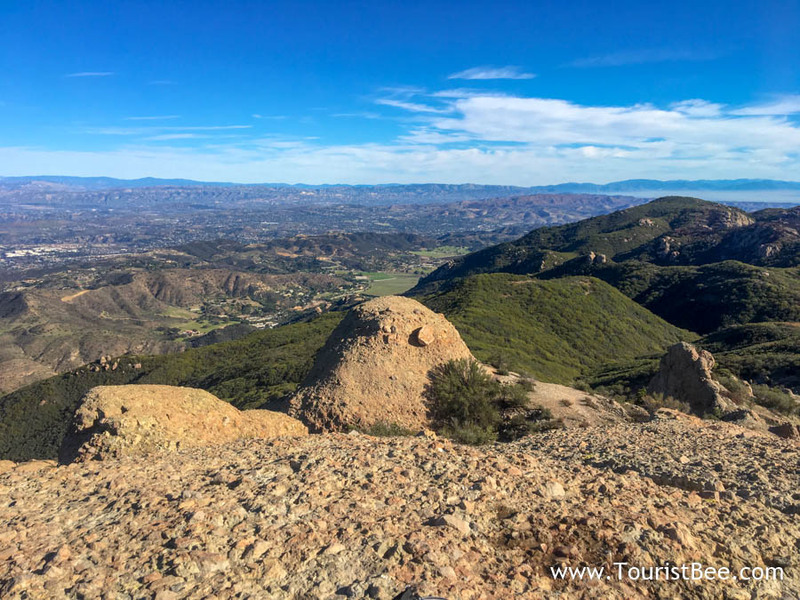 On a clear day, the top of Boney Mountain provides amazing views of La Jolla Valley and canyon all the way to the ocean and Channel Islands National Park. 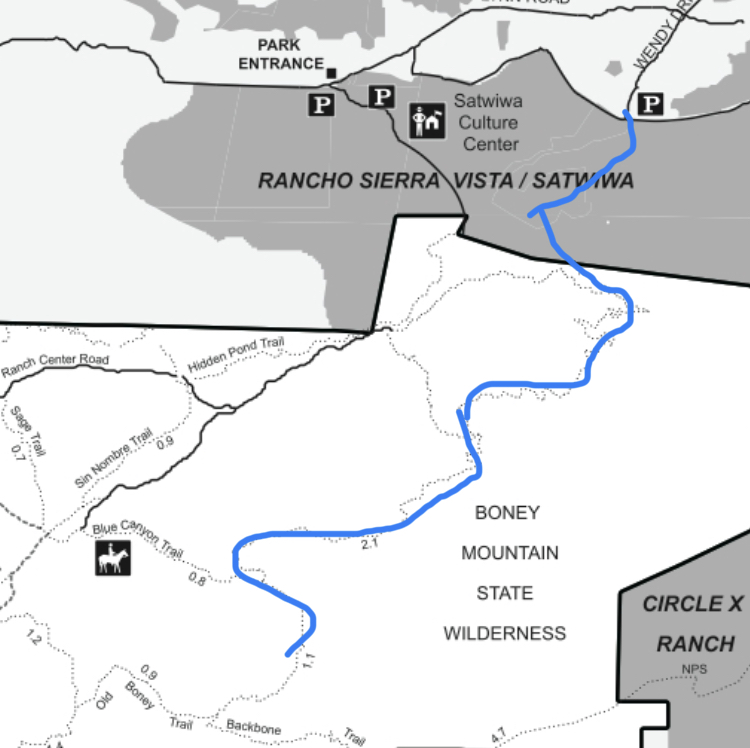 There are several ways to get to Boney Mountain, but the shortest trail is from the Northern end of the park at the intersection of Wendy Drive and Potrero roads. This is called the Wendy Trail Head (click for Google Maps location). From there it takes about 2.5 hours of moderate to strenuous hiking to the top of Boney Mountain. Unfortunately, it takes just as much time coming down as the trail is very steep close to the top. 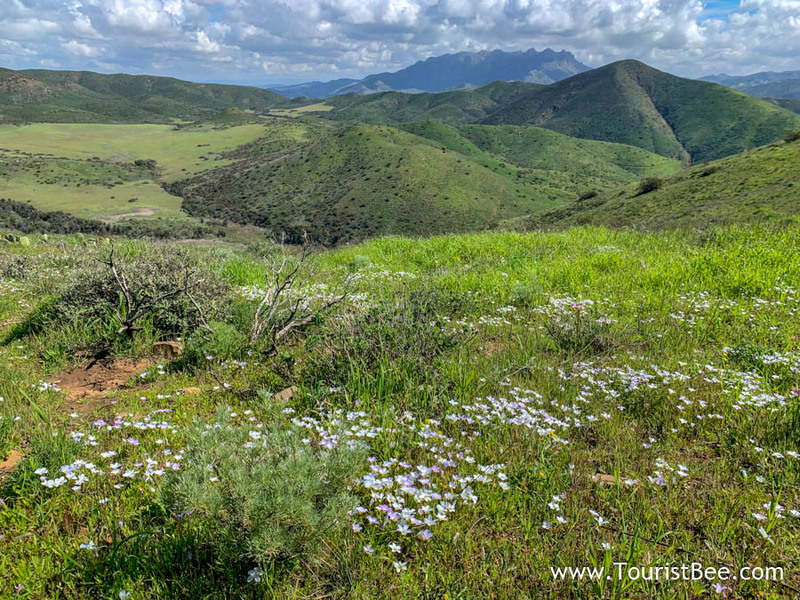 Being 1266 feet tall, Mugu Peak dominates the southern part of the park and provides an amazing panoramic view of the shoreline and Mugu Lagoon and Oxnard plains. There are two main ways for getting to Mugu Peak. My favorite and shortest way is to take the Chumash Trail off of the Pacific Coast Highway right after the Mugu Rock. The trail takes you to Mugu Peak and the loops back around as it provides beautiful views of the Pacific Ocean for most of the trail. 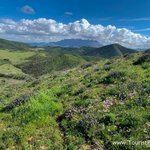 Taking the Chumash Trail (click for Google Maps location) and loop to Mugu Peak takes about 3 hours round trip with the first 30-40 minutes being strenuous. The other way to reach Mugu Peak is from La Jolla Canyon. If you choose this route, stay left as you climb. 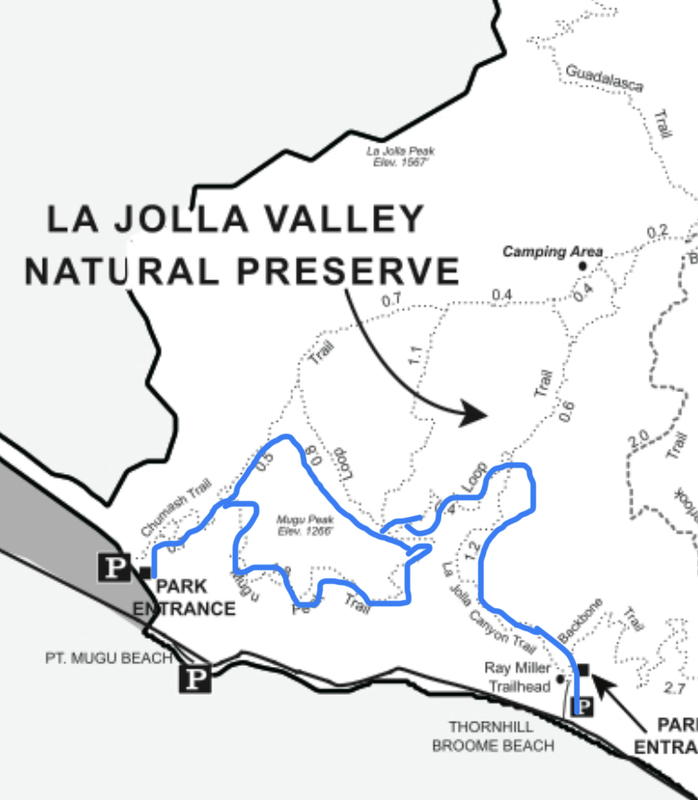 On the Southern side of the park, La Jolla Canyon provides a beautiful access point for the Point Mugu Wilderness area and La Jolla Valley. Located right off the Pacific Coast Highway, La Jolla Canyon entrance is clearly marked and provides day use parking and restrooms. For free parking however, you can easily find parking along Highway 1. La Jolla Canyon is great point of access to climb Mugu Peak especially if you look for a longer but easier climb. Sycamore Canyon provide another beautiful entrance to the park from the southern side. It follows right after La Jolla Canyon and it provides similar type of hiking as it provides access to the Boney Mountain Wilderness. Wildlife abounds around the beach area of Point Mugu State Park. You can see lots of birds. You can see pelicans, sea lions and dolphins on any regular day around Point Mugu State Beach. Right before (if you come south on the PCH) the Mugu Rock on the right side of the PCH you can see a wildlife preserve area that is home to many birds. Mugu Rock is a symbol of this area as the Pacific Coast crosses right in between the sharp cliffs of Mugu Peak on the east and the imposing Mugu Rock to the west. You can easily stop in the small parking area and explore the ocean around Mugu Rock. 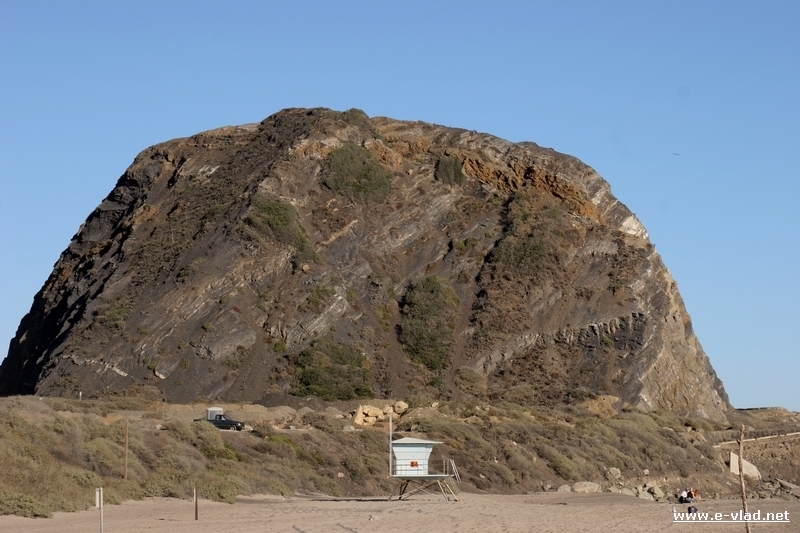 The imposing Mugu Rock is a landmark of this area. Right past the large Mugu Rock, on the ocean side you can pull your car on the side of the road and descend to a small sandy patch. This small beach is rocky but beautiful and it can be overrun with water at high tides. Point Mugu is right on the coast of California between the Port Hueneme and Malibu. Actually it’s just east of Port Hueneme and the Mugu Navy Base. Many people pass right by it not knowing its name. 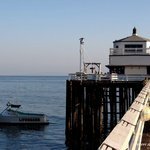 It is located right on the 1 Highway (Pacific Coast Highway) and it’s very easy to spot because of the huge Mugu Rock that stands out on the side of the road towering over the ocean waves. So, depending where you’re coming from on the PCH you can’t miss the Mugu Rock. From the 101 freeway you can exit Las Posas Road in Camarillo and head south towards the ocean. 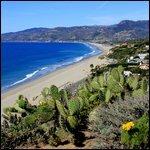 Las Posas will take you to the Pacific Coast Highway (PCH) which you would take south for a couple of miles. It would take you about 15 minutes from the 101 to Point Mugu. Map of Point Mugu, California and surrounding area. Once you see the Mugu Rock look for an entrance to the beach parking area on your right. It costs $5 per day to park at the beach. If you would rather not pay the $5 fee, you can keep driving past the Mugu Rock and park on the right in the first stop on the side of the road. 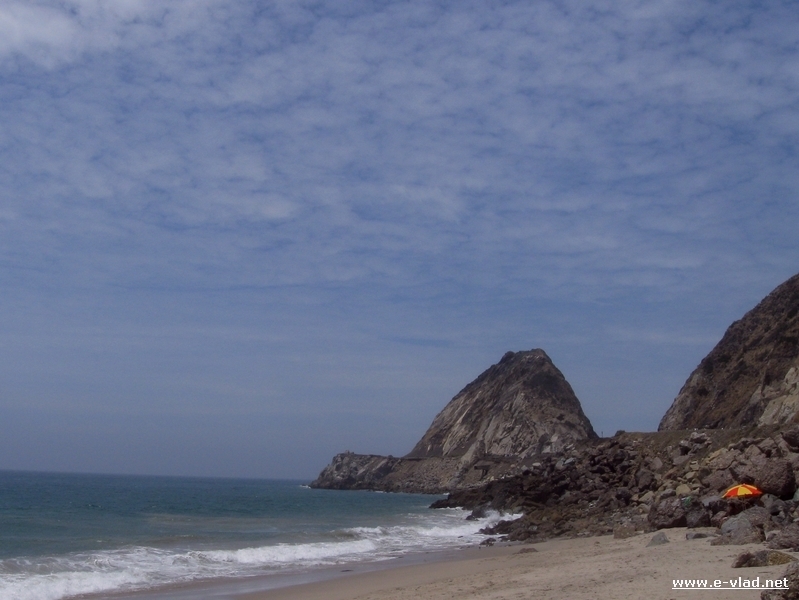 There is a nice little beach there that gives you a great view of the Mugu Rock. It’s great for children because there are lots of rocks that hide lots of marine life forms. Visit the Point Mugu State Park WebSite to plan your trip. 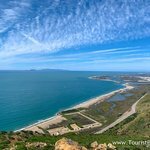 Checkout the Point Mugu State Park Map for details on hiking trails. Jeffrey…you were right! This article was left unfinished even though I had a lot of experience hiking in Point Mugu State Park. I have started fixing the article to provide more specific information.